(Phys.org) —On Saturday, an asteroid the size of one and a half football fields flew within 240,000 miles of Earth. If the space rock had hit land, it would have leveled an area the size of San Francisco Bay. If it had hit the Pacific Ocean, the impact would have sent a tsunami to every facing shore. 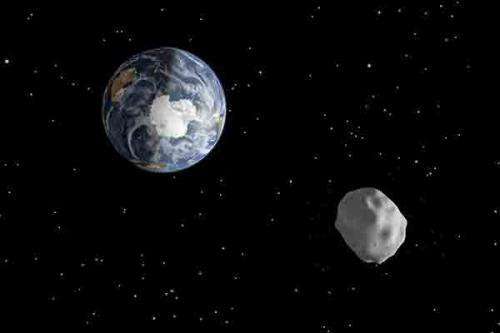 But what is perhaps most alarming about this particular asteroid, called 2013 ET, is that, until March 3, no one had any idea it was headed toward Earth. Many asteroids that come near Earth – such as 2013 ET, or 2012 DA14, the football stadium-size asteroid that passed inside the orbit of Earth's communication satellites in February – have unusually long orbits. There are an estimated million of these near-Earth asteroids longer than 100 meters, or about 300 feet. But because they are relatively small and spend so much time far from Earth, scientists tend to find them only by chance. "We know about 90 to 95 percent of the asteroids larger than a kilometer," Hubbard said. "But we know only maybe 1 percent of the asteroids in the 100 meter range." This is worrisome, considering that an impact from a 100-meter asteroid would be equal to detonating a 100-megaton hydrogen bomb. The first step toward protecting the planet from these asteroids, Hubbard said, is to detect them. To that end, B612 is in the process of raising public funds to build an asteroid-hunting space telescope called Sentinel. Near-Earth asteroids are particularly difficult to spot. In addition to being relatively small, they are comprised mostly of black carbon, so they blend in with the equally black background of space. The upside to being dark is that the rocks absorb a decent amount of heat, which will make them obvious to Sentinel's planned array of infrared detectors. "Once we detect an asteroid and track it long enough to know what the orbit is, then we can just apply the laws of physics and know exactly where it will be 50 to 100 years from now," Hubbard said. Using this method, Sentinel, which will cost around $450 million to build and launch, should discover nearly all the asteroids larger than 140 meters, and about half of those between 50 and 140 meters. "The fundamental technology needed to achieve this exists, we just need to demonstrate that the detectors are sensitive enough and scale up to what we need," he said. "We're drawing on the heritage from two previous space telescopes, Kepler, which was used to detect exoplanets, and Spitzer, an infrared telescope. So far it all looks very doable, but we need a prototype to confirm the design." Should Sentinel find an asteroid on a crash course with Earth, the Hayabusa and Deep Impact spacecraft (asteroid and comet impactors, respectively) would provide a basic strategy for deflecting the rock: run something into it. "We just need to alter its velocity by about the speed of an ant walking, and over the years its course will be changed enough so that it will miss Earth," Hubbard said. "You don't need a nuclear bomb to do that." Another plan calls for a gravity tractor, a process that involves placing an object in the vicinity of the rock. The gravitational interaction between the asteroid and the object throws off the asteroid's velocity by a tiny amount that multiplies over time so that it misses Earth. But neither of these solutions is possible unless we know an asteroid is bearing down on us a few years in advance, making efforts such as Sentinel all the more important. Isn't it the job of Corporations to protect their market? Isn't it therefore their job to protect the earth from destruction? Where is the Corporate Funding? Isn't it odd how American Corporatists like TaredE insist that Corporations have the right to benefit from what Society provides them and yet also insist that those same Corporations have no obligation to pay for the maintenance of that society? If American Republicans believe that Corporations are people, then why do their flat tax plans always tax corporations at a lower rate (often zero) compared to the planned rate for Real, Living Americans?